We were working at the fire-hall by the Toronto Zoo when I noticed something hanging oddly in the air a few feet off the ground. Upon closer inspection I could see that this poor little guy was hanging by some string which turned out to be Kite string. This Kite string was suspended between two trees and the poor Owl must have been flying through and caught one wing in this strong, thin string. He had probably been hanging since night as they are nocturnal and it was now 11:00 am. He was caught up real bad and was tangling himself worse every time he tried to free himself. We managed to free him and his wing was in bad shape, he was sent to the Toronto Wildlife Center who assured us they would look after him. These people who fly these kites have no regard for animals, birds, our cars or even my head as we have this string strung all over the parking lot after every weekend of these idiots having their Kite wars. They just cut the string and leave it everywhere. It is now time to do something about these ignorant self serving litter-bugs. If anybody has any idea where to start with putting a stop to this behaviour please let me know by adding comments at the bottom of this page. Anyways, it all turned out good so far and I am awaiting a synopsis of the owl's check-up by the staff at the center. Hope he can be returned to the wild. If anyone knows what flavour he is please advise. He looks like a baby Horned Owl, but what do I know. Thank you, Jack, for sending us your report and adorable pictures of this injured little fella, and bless your heart for taking him where he can be repaired! 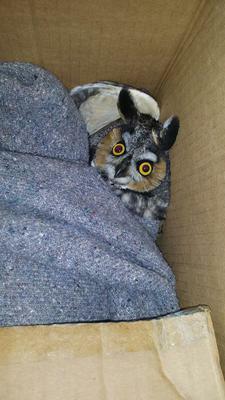 I also think he is a Great Horned Owl. I hope they fix him up and get him back in the wild - he is so cute! ps - I hope you don't mind, but I took out your email address - I don't want you being buried under an avalanche of spam! 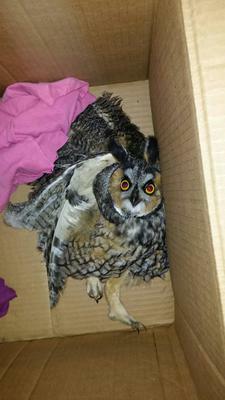 An update - This owl had a full recovery! I am sorry but I cannot take credit for this article, my wife has been courteous enough to write about this lovable fella. It was very sad to see what man's ignorance can do to wildlife. Thanks Wifey! Kite string, Jack, is a horrible hazard to birds and wildlife in the GTA. I'm out on a regular basis photographing birds and I see a lot of it hanging from trees in Scarborough and Markham. I've noticed in Woodlands Rouge Park not far from the Zoo at Steeles and Reesor Rd the trees are covered in kite string. The City posted signs stating Kit flying is prohibited at Woodlands a couple of years ago, however if memory serves me the signs are just in English, but should also include Mandarin and Cantonese. I was actually interviewed for Omni TV this Summer regarding another sign posted at Woodlands Rouge Park prohibiting the removal of fiddleheads and because the signs written in English also included Mandarin and Cantonese, the Asian community felt offended. I told them because of the large Asian community particularly in Markham, it was for the benefit of those that couldn't read English. I was not offended because it was written in English and they shouldn't feel offended with it written in Mandarin and Cantonese. I'm not sure who is responsible for posting these signs, but I would contact, Conservation Ontario, Parks Canada and the City of Toronto. I'm sure one of these will be able to address your concern and maybe if I'm correct in the signs being written only in English, you might suggest these kite signs also include Mandarin and Cantonese. Thank you for saving this little Owl and I hope he recovers and is able to fly again. If not I hope someone involved in Conservation uses him as an educational tool and giving people an opportunity to see up close a beautiful creature in the wild so few of us have the opportunity to see. Looking forward to seeing an update.